Australia generates around 56 million end-of life passenger car tyres each year, with many ending up in landfill, illegally dumped or exported overseas. These tyres contain resources which can be utilised by tyre recyclers to create many different types of products. Australia is no stranger to these products, such as rubberised asphalt and spray seal, which have been in use since the 1970s. The major challenge that the industry has faced has been to find a way to increase the volume of tyre-derived rubber crumb used by bituminous products. To help tyre recyclers with this issue, Tyre Stewardship Australia (TSA), in partnership with organisations such as the Australian Asphalt Pavement Association (AAPA), has been making progress to provide a sound, sizable, domestic market for tyre-derived rubber crumb. One of the most important outcomes for the market development work has been the creation of new national specifications for crumbed rubber modified (CRM) asphalt types. TSA and AAPA, with the assistance from the Queensland Department of Transport and Main Roads, Main Roads Western Australia, Sustainability Victoria and the Australian Road Research Board, developed the new specifications through research and development data for the new national standards. 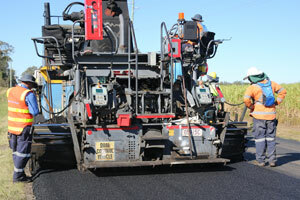 Published in June this year and issued by the AAPA national technology and leadership committee, the new standards facilitated the construction of demonstration trials for CRM gap-graded asphalt (GGA), as well as promoting the wider use of CRM open-graded asphalt (OGA) in Australia. The CRM binder technology in national specifications is based on the technology used in California and Arizona. The CRM OGA mix design process in the specification is being validated through demonstration trials in Queensland, with the first demonstration section of CRM placed on the Gold Coast on June 28. Such real-world trials and applications are a central part of the TSA strategy for building greater acceptance and use of rubberised road products. 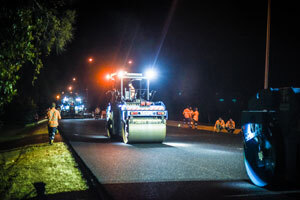 The City of Casey in Victoria is an early adopter of CRM asphalt for its road surfacing projects, getting rid of one of its biggest waste headaches in the process. Michael Apps, City of Casey Team Leader – Civil Construction, says the council started using CRM because of the significant environmental benefits and soon found there were significant practical benefits as well. “The main reason we started using CRM is that it’s very environmentally friendly. The initial driving factor was that we could get rid of old tyres. Like all councils, we have an enormous number of waste tyres that need to be dealt with every year,” he says. The City of Casey has laid 8500 tonnes as of the end of September 2017 across a variety of road surfaces, including roundabouts, heavy-vehicle driveways and patching, which amounts to a total of 13,600 waste tyres redirected from landfill. Mr. Apps says Casey will continue to use CRM and will promote its use among other councils. TSA and AAPA have announced they will also come together again to deliver greater industry knowledge about using tyre rubber in both bitumen sprayed seals and asphalt for roads. The two organisations aim to provide road builders and local government authorities with the confidence to specify both products as part of their regular road building and maintenance programs. A series of short-course workshops run by TSA and AAPA are set to outline best practice and the latest technological developments in road maintenance and building using recycled crumbed rubber. The course will outline the performance benefits of rubber modified bitumen when applied as spray seal, provide both domestic and international examples of successful applications and cover the new national specifications for CRM. One of the core objectives of the short-course is to provide local authorities with the tools to create the technical specification for crumbed rubber road products to be used in their jurisdictions. Liam O’Keefe, Market Development Manager for TSA, sees all the activity around the increased use of rubberised road products as a major step forward. “If we can increase knowledge and arrive at a triple benefit of great roads with a better whole-of-life cost, while making an impact on a challenging sustainability issue, we will have significantly moved the needle towards a truly circular economy,” he says.